I was a fat kid. Fat kids like cake. Once upon a time, when I was eight years old, I cleaned the entire house to surprise my mother. She rewarded me with a gigantic slice of cake. From that point, I scrubbed the entire floor, organized the pantry and washed the dishes in pursuit of that glorious reward — fresh cake. The point is, if you do something right, and you recognize the relationship between your actions and the reward, it makes sense to put forth maximum effort to reproduce the action that resulted in being rewarded. The problem with social media efforts is that success usually goes largely unnoticed by businesses. 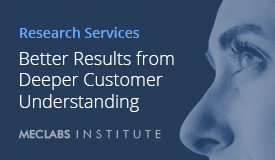 I recently conducted a social media audit for a Research Partner. While working through massive amounts of data provided via Facebook Insight reports, I noticed something interesting. When filtering the most frequently syndicated content to reveal the five most viral posts ever produced by that partner, a pattern emerged. Three out of the top five posts were on the same topic, in the same format. There’s more. The top five most syndicated posts averaged 22,424 stories created per post by users, whereas the bottom half of the top 10 averaged only 6,042 stories created per post by users. So, not only were the top five posts more effective at causing syndication from users, but they were 371% more effective. Since no fat kid would knowingly forgo cake, it’s probably a pretty safe assumption that no business would knowingly do less effective social posting if they knew they could be doing something more effective. (After all, cash is better than cake.) That means the company must be unaware of its achievement. The moral of the story is that you should be visiting your Facebook Insights tab and downloading your reports on a regular basis. Filtering your posts by certain KPIs might reveal very rewarding patterns in engagement and syndication, which could be the push you need to take your social campaigns to the next level. 1) Pull up your Insights page. 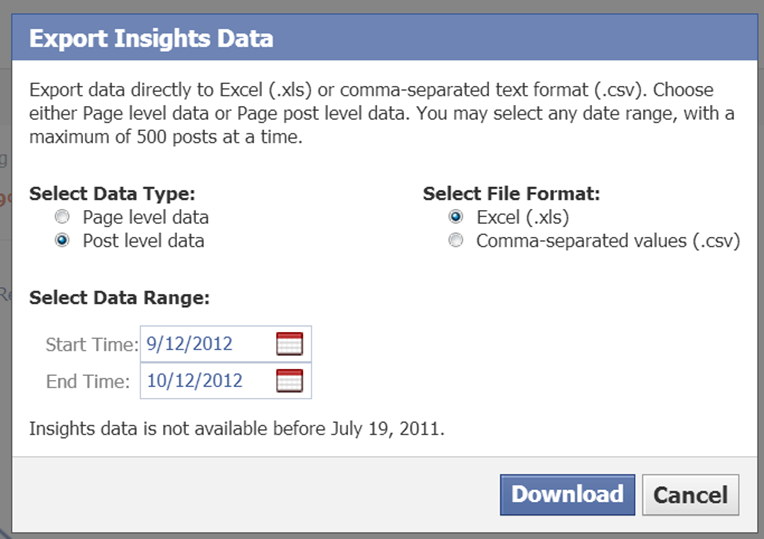 If you don’t know how, just enter http://www.facebook.com/insights into your browser. It should show you a list of all the pages to which you have access. 2) Click on the page of your choice, and export the data to Excel. 3) You’ll get a pop-up box like the one below. For our purposes, we’re looking for post-level data, and we’d like to have it in Excel format. If you’ve correctly done this step, your machine will download an Excel spreadsheet full of data. 4) Once you have your spreadsheet open, you will notice Facebook has given us many good metrics to filter through from Post Type to Lifetime Post Reach. Clicking in the upper left-hand corner of the spreadsheet will select all of the data and enable you to properly filter it. Select a metric that interests you from the “sort by” options. In the drop-down menu under “order,” you can choose “largest to smallest” to see the posts with the greatest numbers. In my example above, I filtered by Lifetime Viral Impressions, but you can use whatever makes sense for your business. After that, it’s just a matter of putting on your detective hat, and looking for similarities and patterns in the data. If you find a certain theme that works best for you, go ahead and test it by increasing the frequency of that particular post type. 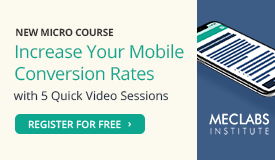 If not, at least you’ve learned how to download and sort Facebook Insights data. Good afternoon – Thank you for the informative article .. Most interesting to us the point about 3 out 5 most viral posts were of same topic .. A general content question about “virality” .. Our data has historically supported that “less is more” and “a picture is worth a thousand words” .. One liners, or really good two-liners are the most provocative and the most likely to provoke engagement … Attaching good linkbait (with a title that promotes curiosity) with a story that has a nice graphic and one to two lines of content (question or other engagement) is our by far our #1 engaging post .. Your thoughts or observations? Thanks for this informative article on Facebook Insights. This was something completely new to me! I’m going to make sure that I follow your advice and implement this into my SEO analysis. Thanks Jonathan. 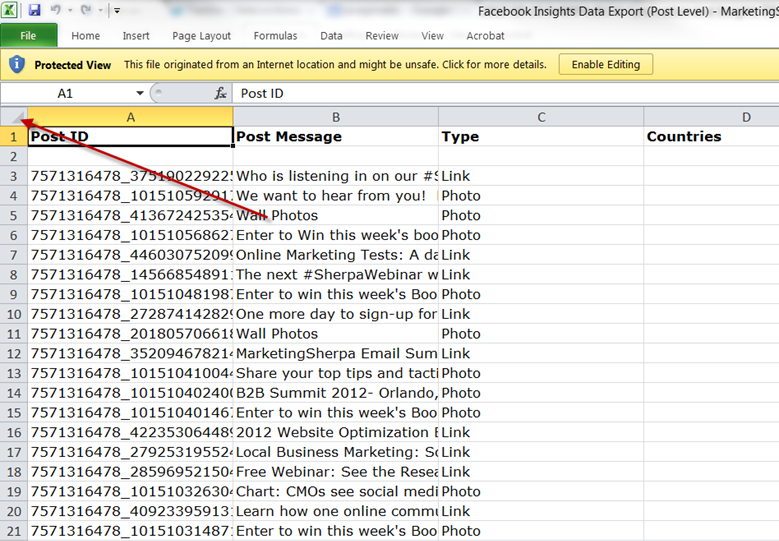 This is an excellent tutorial on how to use Facebook Insights. 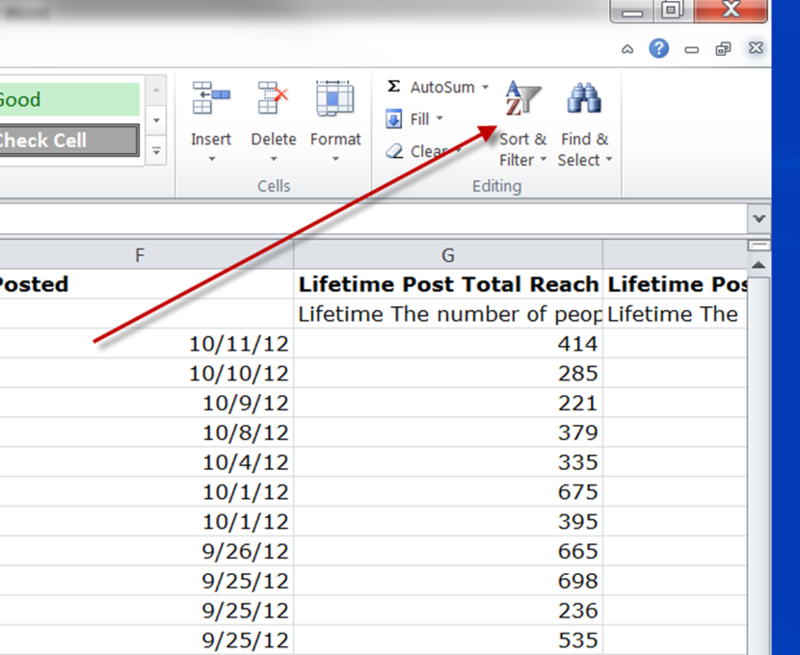 Just one thing, I do not see the “Lifetime Viral Impressions” option on my worksheet or anywhere within the workbook. It might be because I chose the whole year (2012). I will go back and try narrowing it down a bit. Again, I just wanted to thank you for this. 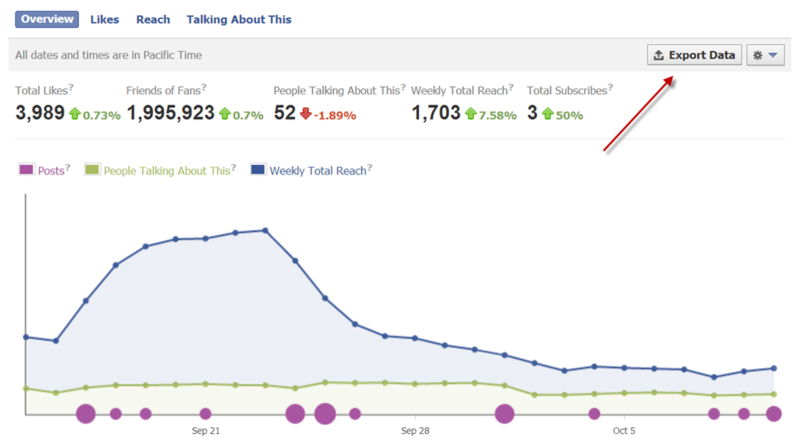 like it….This is an excellent tutorial on how to use Facebook Insights. 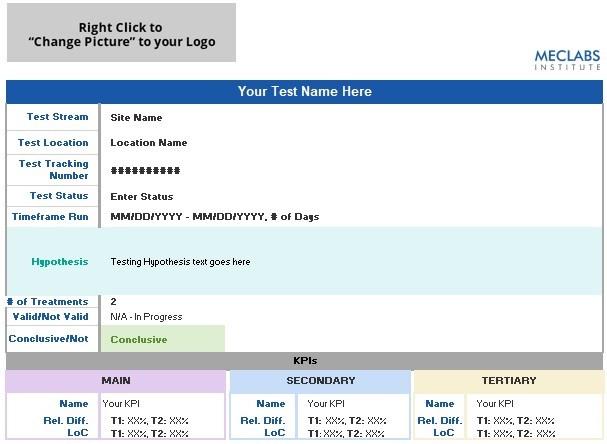 Just one thing, I do not see the “Lifetime Viral Impressions” option on my worksheet or anywhere within the workbook. It might be because I chose the whole year (2012). I will go back and try narrowing it down a bit. Again, I just wanted to thank you for this. Great Article! I never knew you could export the data to excel. That’s a great trick! Thanks for the quality content, and I will look forward to reading your next post!